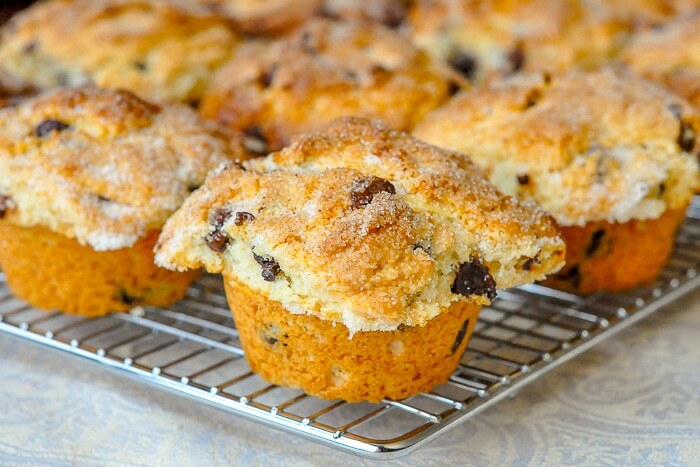 The Best Chocolate Chip Muffins. After over 30 years of baking this is still my favourite chocolate chip muffin recipe. Moist on the inside with crunchy edges on the muffin top and plenty of luscious chocolate morsels baked right in. A perfect muffin. I like a good muffin top. No, I don’t have to call in Newman from Seinfeld to dispose of the muffin stumps, I like those too but to me, a perfect chocolate chip muffin should have a crunchy top and a perfectly baked interior that isn’t dry but is just a little denser than cake. I’m not really partial to muffins that are too cake-like in texture; as a morning food it should be a little heartier than a tender cake. This recipe gets the balance just right. Dark Chocolate Chips at 50% cocoa is my favourite for this recipe but any kind you like can be used. The batter here will be somewhat lumpy but don’t let that bother you; it is as it should be. I also like to sprinkle a teaspoon of sugar over the batter of many kinds of muffins to create a sweet glossy crust but this step is of course, optional. These will make a great start to your weekend brunch! 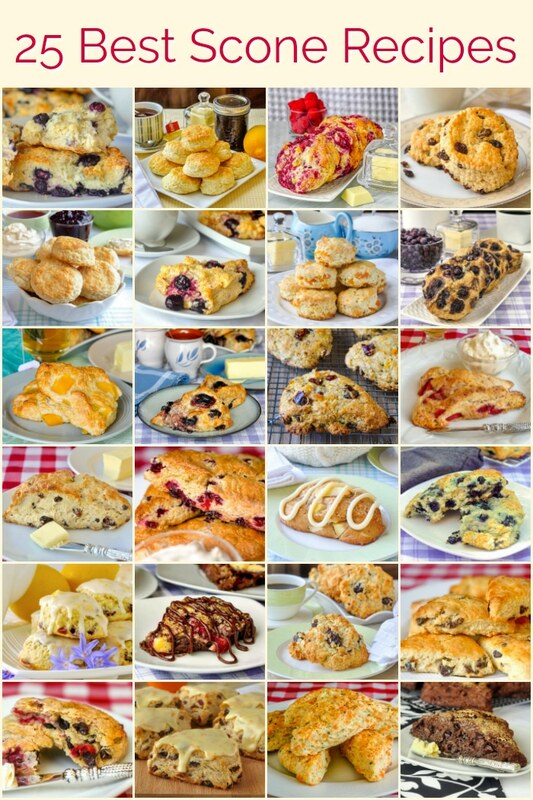 For many more muffin recipes and many other brunch ideas why not check out our Muffins and Scones Category and our Breakfast/Brunch Category. Recipe updated January 2019 to include nutritional values and option for metric measurements. 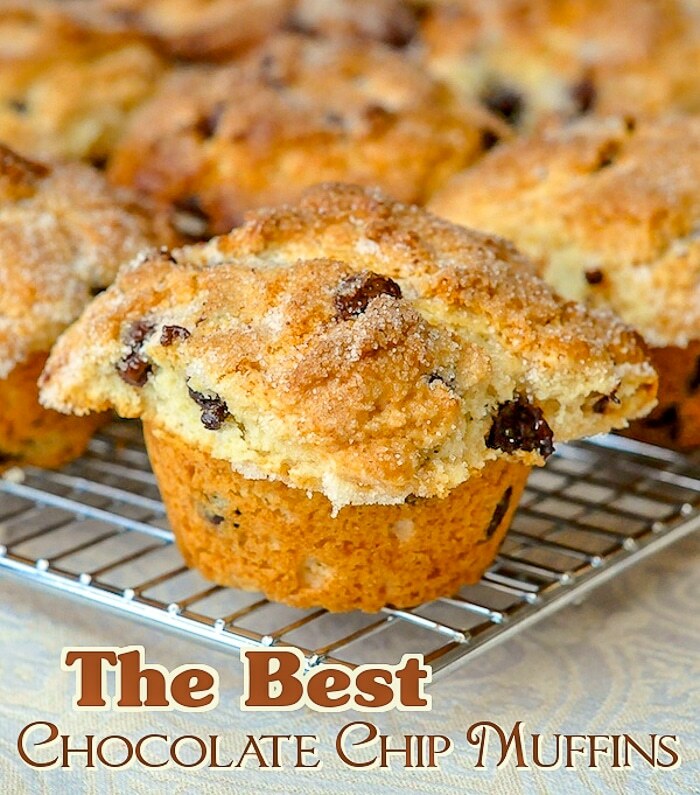 The Best Chocolate Chip Muffins - after over 30 years of baking this is still my favourite chocolate chip muffin recipe. Moist on the inside with crunchy edges on the muffin top and plenty of luscious chocolate morsels baked right in. A perfect muffin. Mix together the whipping cream, milk and apple cider vinegar and add slowly to the mixing bowl continuing to mix but at a reduced speed. Fold in the dry ingredients by hand with a rubber spatula being careful not to over mix. Don't worry about lumps in the batter, they are fine. 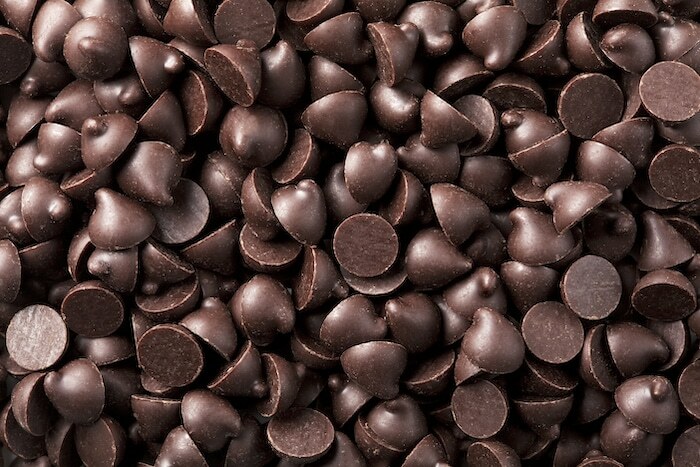 When the dry ingredients are almost incorporated, gently fold in the chocolate chips. Spoon batter into well greased muffin tins, filling them to the top. 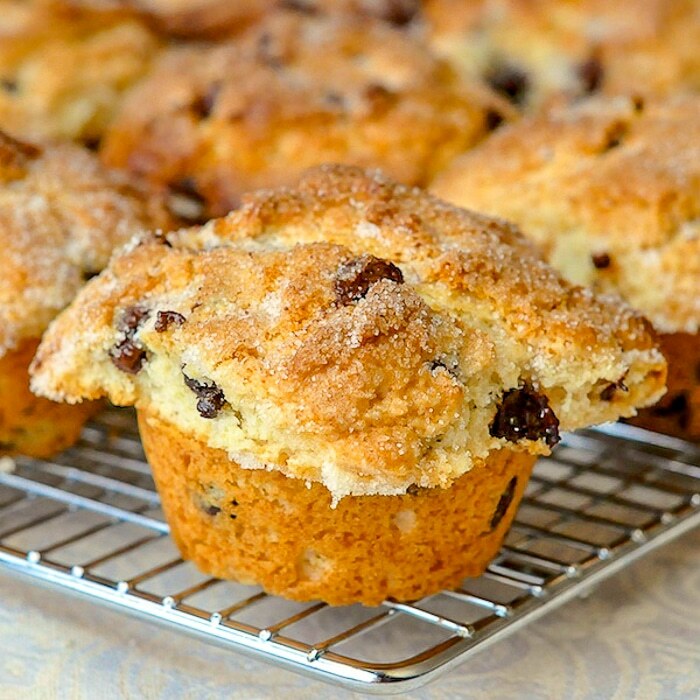 If you like you can sprinkle about a teaspoon of sugar over the top of each muffin before baking. These are without a doubt the best muffins I have ever made. My kids and grandkids now want them all the time. Thank-you for such a great recipe !! They are delicious but how did you get them out of the pan. I did everything as I should. And the pops came off first. Did you use a spray or butter. I grease the top surface pf the muffin pan and the cups very well using plenty of butter and they come out very well in my pans. You can always use paper liners but I often like them the old fashioned way. Made those, they are to die for!!!! Can these be made without the apple cinder vinegar or is there a subsitute vinegar I could use? You can substitute plain vinegar or even lemon juice. My sons love CCC muffins and now I should make these because I like the big top. Was surprised to see apple cider vinegar in the recipe. Do it!! How do you think I started? LOL! Would it be okay to replace the whipping cream with whole milk? My son said these are the best muffins I’ve ever made!! Have you tried this recipe with fruit? Just wondering how that would work. Looking forward to trying some of your other recipes, great blog. Yes, They can be made with berries or chopped fruit. It’s a great base recipe! Made these today and tbey were delicious.Was a bit discouraged at first since I don’t have a stand mixer and did not have any whipping cream.Used my hand mixer and half & half cream ,they turned out great .They are a lot like Tim’s muffins but in my opinion better. Recipe tasted great!! Two things, more guidance on whether or not the muffins should cool in the pan or not may help with getting them out. I greased the cups and the surface but still pulled off a few tops trying to get them out – maybe they were too warm?? Also, I would recommend using a coarse sugar or raw sugar on the tops – granulated sugar isn’t as nice. Still yummy tho!!!! Whats the purpose of the apple cider vinegar in these? I noticed you said that you can substitute for regular vinegar, but will that change the taste or texture at all? Helps activate the baking powder and gets a better rise. I am so excited that I came across your website! Every recipe I have tried has exceeded my expectations. I so appreciate you replying to people’s questions and comments. Keep up the amazing work! Can you add pecans or would it effect the recipe? Do you make them in a 12 muffin tin or the jumbo 6 muffin tin? The recipe should be fine either way. I just got jumbo pans this week and am looking forward to trying them myself. So I know I am probably in the minority here, but I am not a big chocolate chip fan. Do you think this recipe would work alright using blueberries rather than the chips? This recipe looks so lovely I would really like to try with berries, and to me anyway, it looks nicer than the blueberry muffin recipe….I think it must be the sugary topping and big top that is appealing to me! Thank you! I think you are looking at too much moisture from fresh berries. Dried berries, yes though. All of our recipes are easily searched on site. I would not make any changes except for the raisins. Finally made these and they were amazing! !